Leverkusen - Hakan Calhanoglu reinforced his reputation as a dead-ball king in the Rhineland Derby against 1. FC Köln, curling in another of his trademark free-kicks to give Bayer 04 Leverkusen a 2-1 lead and set them on their way to victory. The 20-year-old, who has now scored seven times from direct free-kicks in the Bundesliga, made a major contribution in the Werkself's 5-1 win before talking to the assembled media about the latest product from his repertoire. Question: Hakan Calhanoglu, the whole of the Bundesliga knows how dangerous your free-kicks are, yet you continue to find that top corner with nobody able to stop you. How did you enjoy this one? Hakan Calhanoglu: I had to think about it for a while because one of the Köln players dropped back onto the goalline to begin with. I was thinking of hitting it under the wall, but then I just changed my mind. My strength is finding the top left-hand corner. I just collected myself and then hit the ball well. Question: There was a video of you going around in which you practiced one particular free-kick 50 times. How many free-kicks do you think you actually hit over the course of a year? Calhanoglu: I really don't know, but it's a lot. I'm always practicing to make sure I don't lose my touch. When I score a free-kick like this in a game, then that's the reward for me. Question: How did you find the atmosphere and emotion in your first Rhineland Derby? 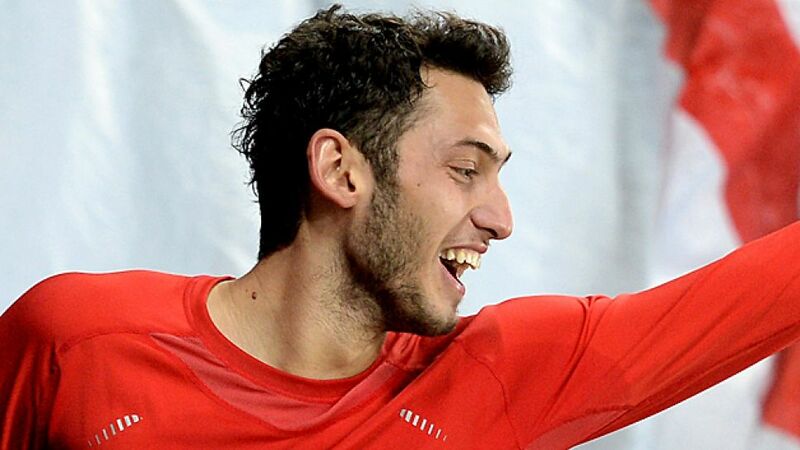 Calhanoglu: You could definitely feel how revved up the fans were. We desperately wanted to win after losing in the Champions League to [AS] Monaco and it's a great feeling when you can give the fans something back. Question: Was it louder than in other games at the BayArena? Calhanoglu: There's always a good atmosphere at our home games. Today I heard the fans that little bit more than normal and that's definitely about right for a derby. Question:Josip Drmic made a decisive contribution, although he's had a somewhat difficult time of things at Leverkusen. What do you make of his performance? Calhanoglu: I'm really delighted for him. He played well against Monaco but unfortunately he didn't take his chances. Today he proved that he's a great forward and a very important player for us. Question: What did you make of the way Köln played? Calhanoglu: Well they didn't really play, did they? All they did was launch long balls. That's all I can really say about them, but we still know that they have a good team and you can't under-estimate them. Question: Between Monaco and Köln, you've played two sides who were very defensive. Does that make you look forward more to the trip to Munich next weekend, against a rival from the top of the table? Calhanoglu: All the teams we play have their own philosophies. Köln played a direct game but we know that Bayern are the best team around. Nevertheless, we want to impose ourselves on the game and we're really looking forward to it. Question: Do you dare to celebrate this win on the streets of Cologne? Calhanoglu: I'm going to be spending the evening with my parents, then we'll see if I go out or not.